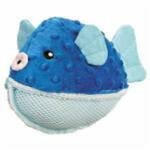 Aquadudes Dog ToysA jolly ball-y dog toy, Aquadudes is perfect for long, sporty hours of interactive fun.Durable, easy-to-toss Grriggles Aquadudes are available in three adorable under-the-sea characters—Puffer Fish, Seal, and Hermit Crab. • Hermit Crab measures 6 OR choose money saving set of all 3 toys !! If a variation combination is unavailable, try changing the other type. For instance, a certain size may not be available in certain colors or vice versa.